Bring water to boil in a pot. Place a clean bowl on top of the pot with simmering water and add chocolate wafers in there. Start to move it around with a spatula and you will chocolate will start to melt in few minutes. Add peanut butter, starting with 3 tbsps. and you can add more if you want more intense peanut butter flavor. Mix it all until all the chocolate & peanut butter is melted. Now quickly melt some peanut butter in microwave. Add few drops of melted peanut butter on top of one muffin at a time and using a toothpick or knife, make swirls around. Repeat with the rest and pop them in refrigerator until chilled for 2-4 hours. Store in an airtight container in the refrigerator. Layer all pretzels on the sheet. Place half of caramel squares on each pretzel. Bake in the oven for 3 to 5 minutes. The caramel will be melted but not completely filing the holes of pretzels. It will spread as it cools. Cool pretzels completely before dipping in chocolate. When cool, dip pretzels in chocolate (cover whole pretzels or dip halves). Tap against the bowl with chocolate to help excess drip off back to the bowl. Place back on the sheet. Dust with sprinkles. Let cool completely. *Side note: If your oven runs hotter, bake the pretzels for 4 to 5 minutes. The caramel is just supposed to be heated up to soften. Put the semisweet and white chocolates into 2 separate heatproof medium bowls. Fill 2 medium saucepans with a couple inches of water and bring to a simmer over medium heat. Once the chocolates are melted and smooth, remove from the heat. 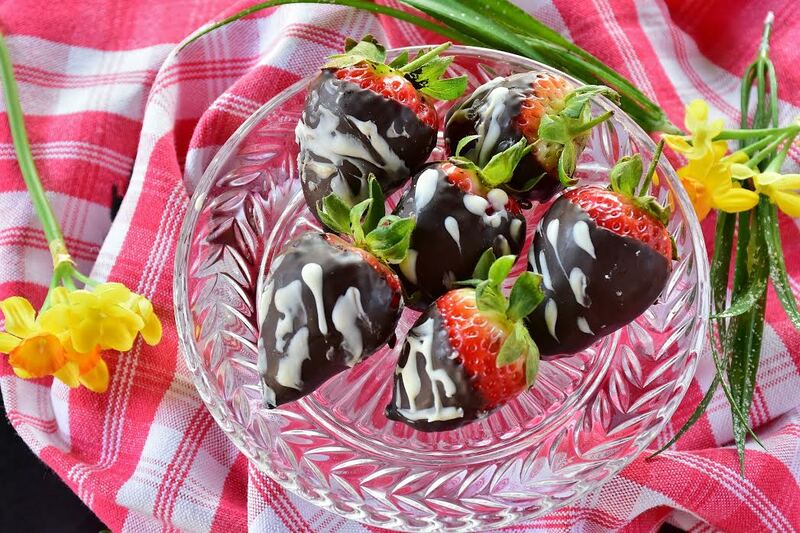 Holding the strawberry by the stem, dip the fruit into the dark chocolate, lift and twist slightly, letting any excess chocolate fall back into the bowl. Set strawberries on the parchment paper. Dip a fork in the white chocolate and drizzle the white chocolate over the dipped strawberries. *If strawberries are not your snack of choice, try dunking cherries, rice crispy treats, pretzel rods or even marshmallows into the melted chocolate mixture for a delicious treat. Melt the white chocolate and green mint wafers together. Use a double boiler or microwave. If using microwave, stir the chocolate every 20 seconds to help avoid seizing. Once melted and smooth, stir in oil and peppermint extract. Set aside. Melt the semi-sweet chocolate in the same manner you melted the chocolate in step 2. Pour onto prepared baking sheet and spread out into a large rectangle. Drizzle the white chocolate mixture on top in lines. See photo above for a visual. Use a toothpick or knife to swirl the layers together. Sprinkle the top of the bark with Andes mints, if using. Allow the chocolate to set at room temperature in a cool, dry environment. My swirled barks usually take around 45 minutes. If needed, you can stick it in the refrigerator to help speed things up. Once hardened, break into pieces as large or as small as you want. *Side note: If you wish to make the bark ahead of time, store it in an airtight container at room temperature in a cool, dry place or in the refrigerator for up to 3 weeks. For longer storage, freeze for up to 2 months and thaw overnight in the refrigerator. Your search for high quality, affordable, and no fuss chocolate wafers has come to an end with our vast selection of wholesale bulk chocolate. We have compiled a wide array of chocolates in various colors, flavors and sizes to take the guesswork out of buying chocolate. Our chocolate wafers come from world-renowned companies, such as Callebaut Chocolate, Wilbur Chocolate and Guittard, among others and can be used in a variety of recipes that will have people begging for seconds. These wafers come in varying levels of sweetness from classic milk chocolate all the way to intense unsweetened chocolate for baking. Whatever your chocolate masterpiece dream is, we can help you make it happen. You do the dreaming; we’ll provide the chocolate.